French Bar Schools students are allowed to start the LL.M. program on January 2019, in Singapore Only. 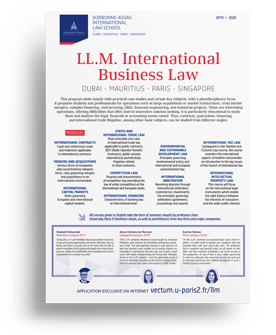 In partnership with Paris Bar School (EFB), the LL.M. can be validated as part of the « P.P.I. » (Projet Professionnel Individualisé). Students are allowed to apply before having the definitive results of CRFPA exam. If admitted, they will follow the LL.M. from January to June 2019. Discover Sorbonne-Assas International Law School and learn more about what its unique programmes can bring you!